Sidewinder Subs opened in the fall of 2010 and been making great subs ever since. 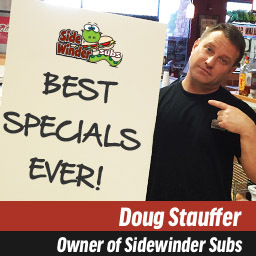 The owner, Doug, has been crafting sub sandwiches for over a decade and has created a menu of traditional sub sandwiches, each with the Sidewinder touch. Our sub sandwiches are made using only the freshest of ingredients to ensure that your sandwich is an amazing experience. Our bread is baked fresh daily and we think you’ll agree, it is delicious. Our Gilbert location features 4 large screen TV’s with access to local and national sports programming. If you want to see a game, just let us know we’ll get it on the big screen for you. 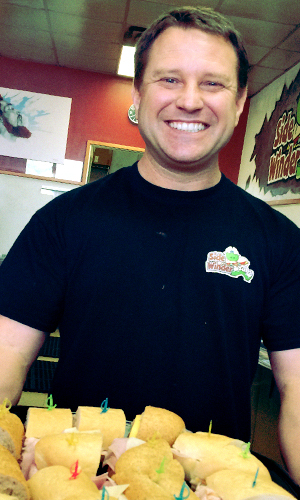 Click play on the video below to see Doug in action… and for a special offer just for you!